If I was a retailer in Dublin I would be lobbying hard to close the border with Northern Ireland - quickly. I spoke recently to a retailer in South County Dublin about the outlook for the Christmas shopping season. In her view her biggest competitive threat is not the nearby Dundrum Shopping Centre but rather the Sprucefield Shopping Centre nearly 100 miles away across the border. Over the past few weeks I've spoken to a large number of consumers and they are all saying the same thing: 'Go North for Christmas'. This is a disaster, of course, for the Republic's already battered retailers. Our political leaders (I know, don't laugh, it's rude) have called on consumers to be more patriotic and shop 'local'. Nevertheless the same geniuses have decided to increase the vat rate in December to 21.5% because [ ]. Sorry, I meant to write in a rational explanation at the end of that sentence but for the life of me I can't think of one. Irish retailers are heading into a perfect storm: not only is the economy in a deepening recession, on most measures their costs of doing business are rising (thanks to local authority rates among other burdens); and even worse, the euro is stronger than ever against sterling. This time last year a shopper heading North would have got £7 worth of goods for €10; today they will get £8 worth for €10. Expect to hear a giant sucking sound this Christmas as shoppers surge across the border. Can it get any worse? Unfortunately yes. 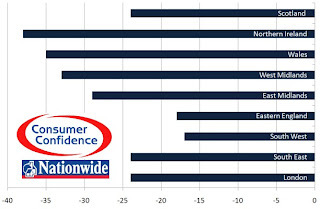 As the graph shows - from the excellent Nationwide Consumer Confidence Index - Northern Irish consumers have seen the steepest falls in consumer confidence of any region in the UK. That means only one thing: consumer spending by Northern consumers will fall because of the measurable relationship (pdf) between bad economic news, consumer confidence and subsequent spending up to 12 months later. Northern Irish retailers will have only one option: cut their prices (even) further in order to attract more bargain-hungry, euro-bearing Southern shoppers. The South Dublin retailer I spoke to is now seriously thinking about opening a store in Newry. I don't blame her. This is of course not about NI being cheap: it's about the Republic being expensive. Anecdotal evidence: the brother just bought a good second-hand car in the North for literally half what he was asked for in the South. And that's taking import taxes etc into account. The problem must in part be that customers will no longer bear the margins retailers have become accustomed to, or to be more precise, are willing to pay in time so that they pay less in cash.